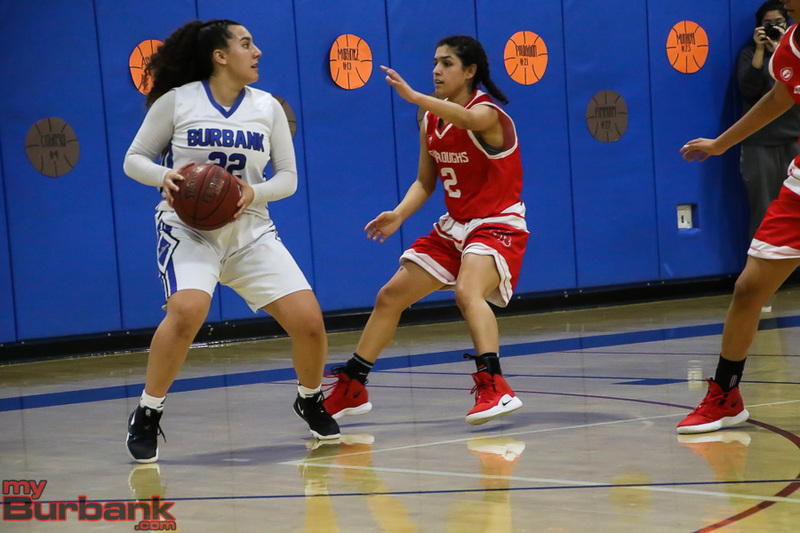 Both Burbank and Burroughs Highs have lost some key athletes to graduation, but that shouldn’t play a key role in the success of both schools this season. The Bulldogs appear to be strong as a dual meet squad and the Indians appear to have found their next pole vault star. The Bulldogs won the boys’ league dual meet title last year and are hoping to duplicate the feat. 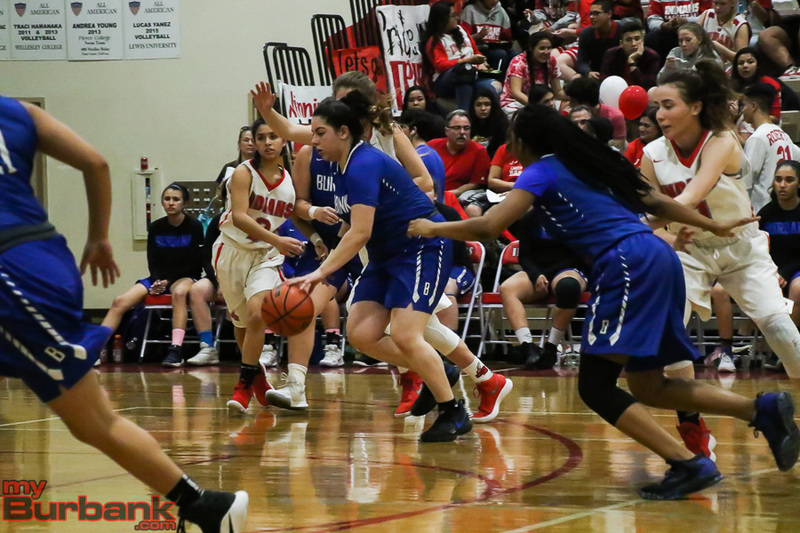 “That’s what we’re shooting for,” said David Card, who took over as head coach after serving as an assistant to longtime head coach Darin Wolf. 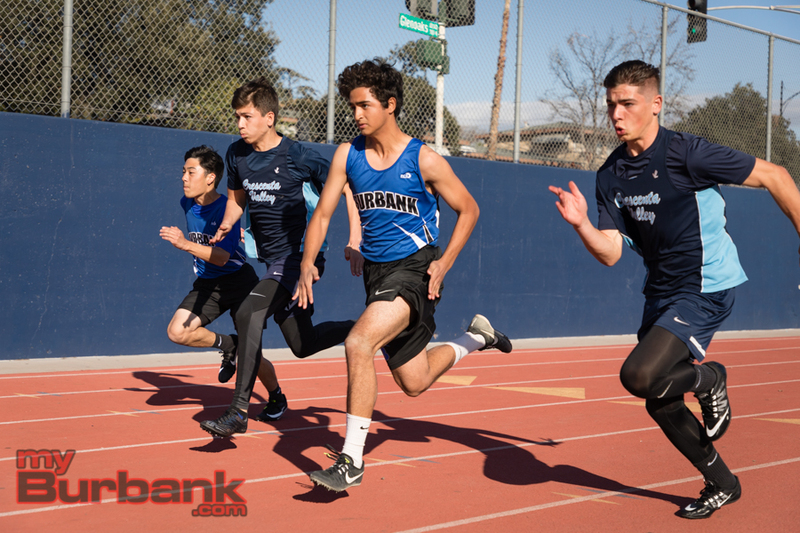 Burbank has a strong group of sprinters and distance runners that could go deep into postseason competition. The spring group is led by junior Bryan David, a 400 meter specialist, who ran under 51 seconds last season. 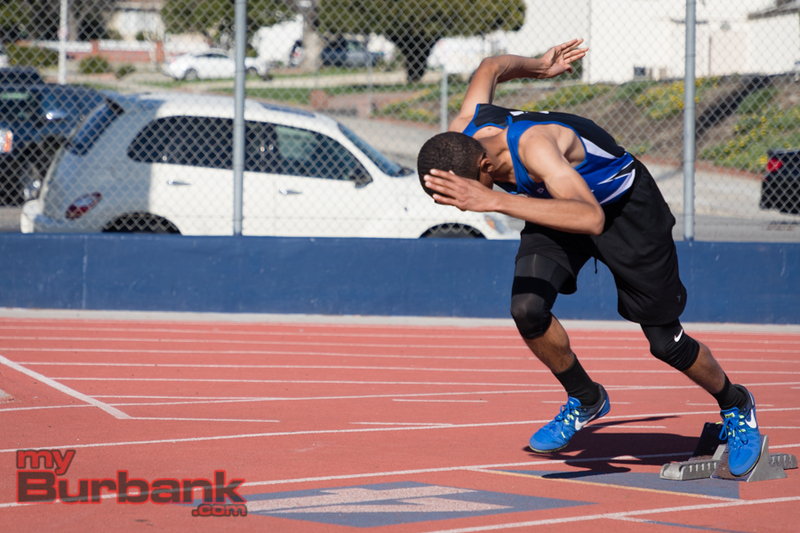 Freshman Jack Sapyta is one of the best sprinters to ever come through Burbank. 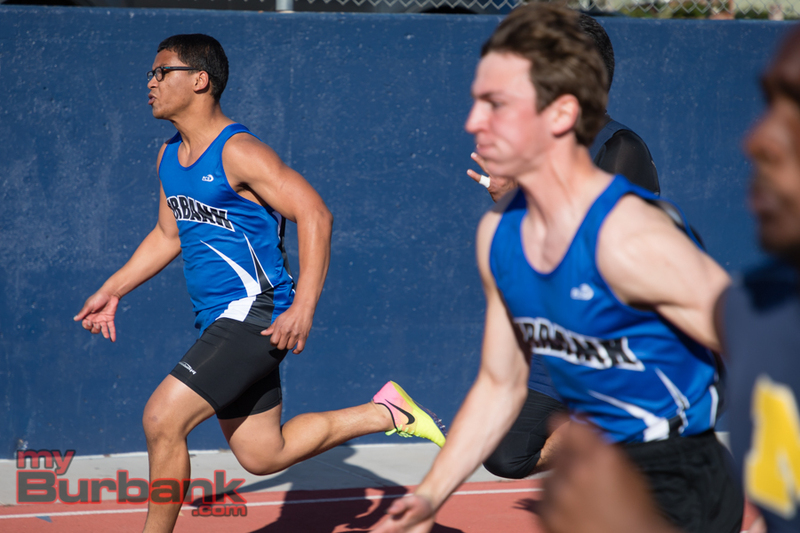 He ran the 200 meters in 22.73 seconds last year with the Burbank Vikings. Junior Cole Le’au is also back. The Bulldogs have picked up a transfer in Kendall Fauntleroy, who will become eligible in late March. Sophomore Dylan Branden is another sprinter to watch for. The distance running group is led by sophomore Andres Leon and junior Victor Goli. They are supported by a host of others. Senior Zion Chavez will be counted on to provide points in the long and triple jumps as well as in the pole vault. James Symth is the defending league champion in the discus and will provide some key points in the throwing events. Sophomore Marcus Halm is solid in the jumping events and the hurdles. 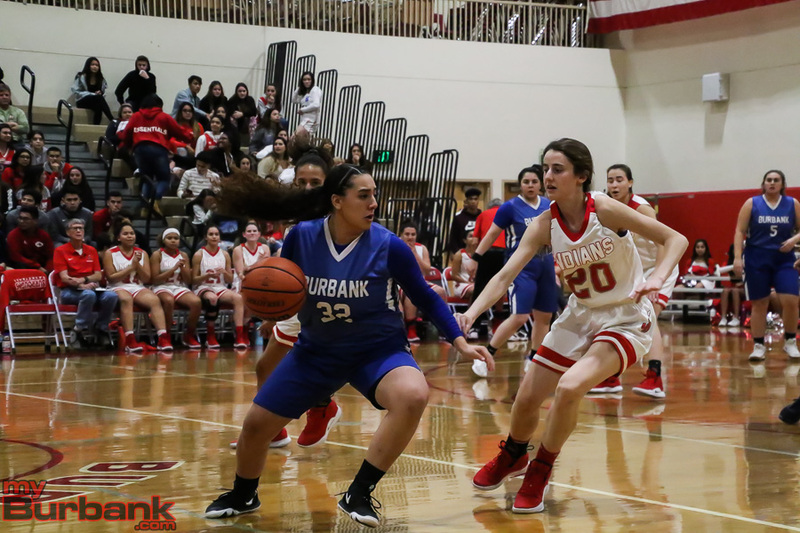 On the girls’ team, Burbank appears to be in a position to compete for a league title. 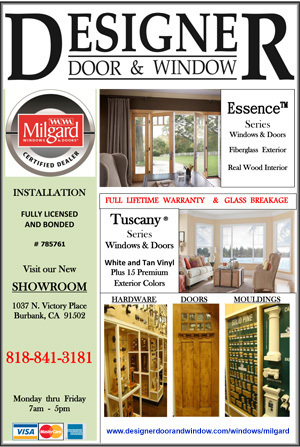 “We have the depth and quality to challenge Arcadia,” Card said. Sophomore sprinter Stephana Powell is a transfer from Van Nuys High and should be solid in the 200 and 400 meter events. 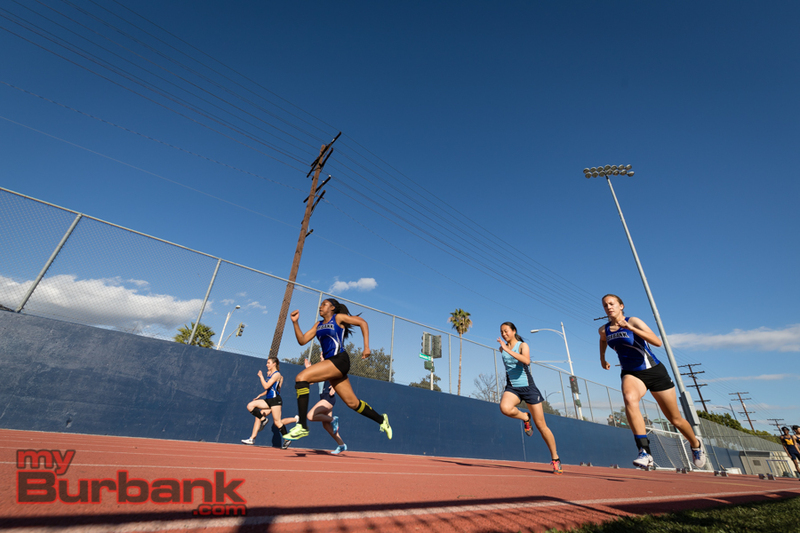 Sophomore Jayla Flowers could be on the best Burbank has ever had in both the sprints and in the long and triple jumps. The distance running crew is very deep and led by senior Shalom Mejia and junior Sol Fernandez. Sophomore Tamryn Betts is the returning league champion in the high jump. 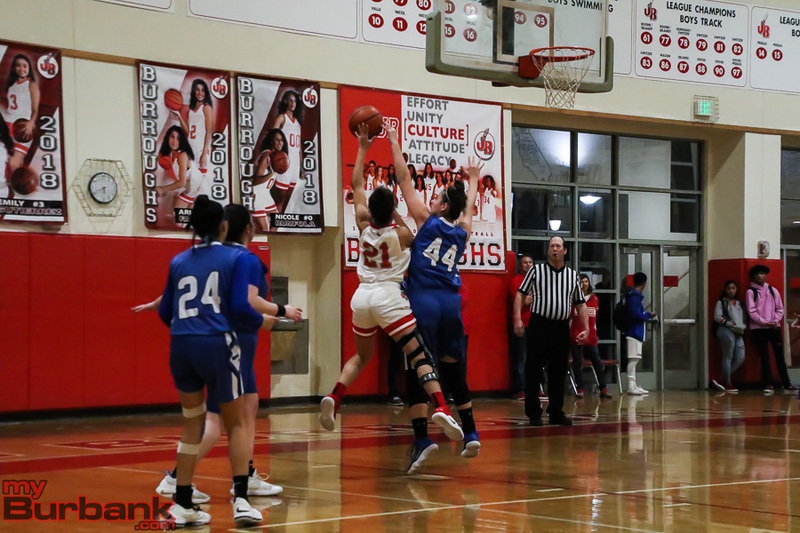 Freshman Emma Cusumano has the potential to be a star like her older sister, Haleigh, who graduated from Burbank in 2017. The Indians are not as deep as in the past, but still have a few elite individuals. Sophomore Eli Gault-Crabb could be the next in a long line of pole vault stars. He opened the season against Canyon High by clearing 14 feet, 2 inches. Junior Caleb Black is an elite 400 runner for coach Levon Davis. “Caleb, if he’s healthy, he might go 48,” Davis said. Senior Raymond Berrellez along with junior Logan Berger and sophomore Jimmy Nealis give Burroughs a solid distance running group. 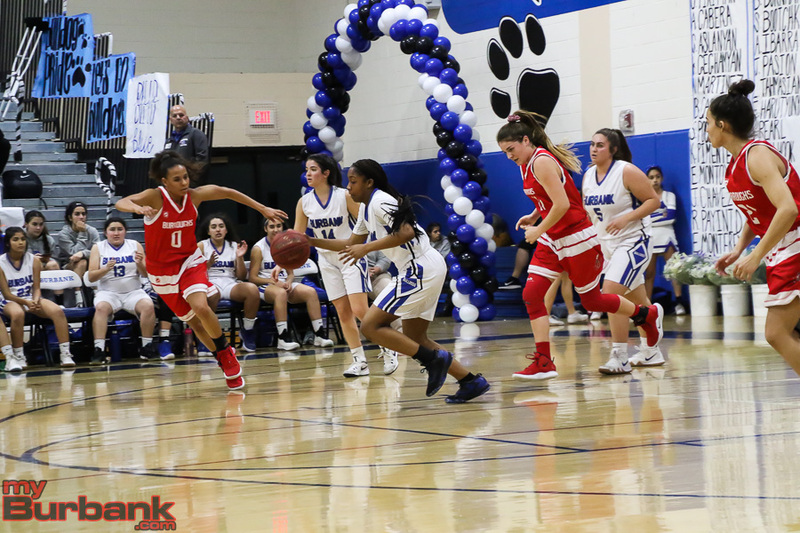 The Burroughs girls’ team is led by senior sprinter Jada Martinez-Reese. Sophomore Elizabeth Surratt could have a breakout season in the 300 intermediate hurdles after going 47.57 in league finals last year. 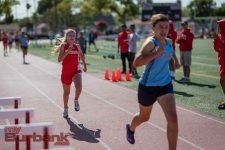 Burroughs will rely on a solid core of a distance runners to get the bulk of their scoring from. 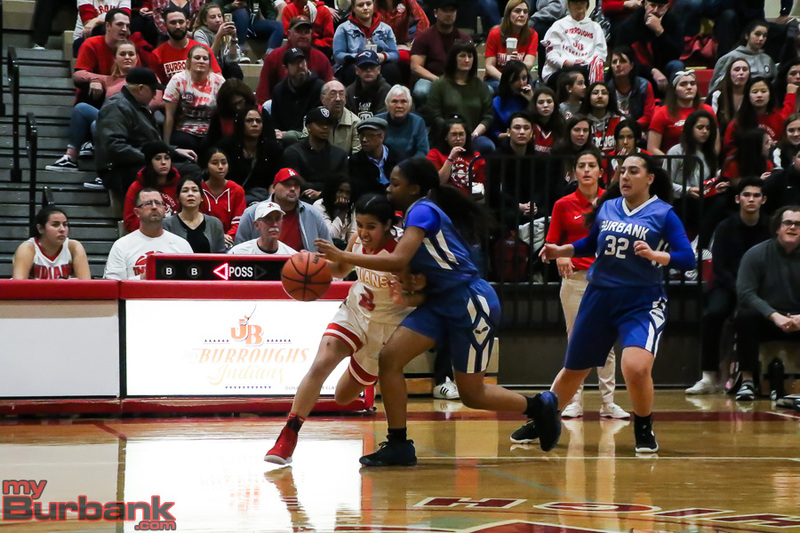 Sophomore Jordan Guzman, senior Lakely Nealis and freshmen Sophia Navarro and Kimberly Ramirez should make significant impacts. 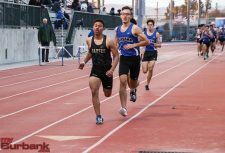 This entry was posted in Sports, Track and tagged Andres Leon, Bryan David, Burbank track and field, Burroughs track and field, Caleb Black, Cole Le’au, Dylan Branden, Eli Gault-Crabb, Elizabeth Surratt, Emma Cusumano, Jack Sapyta, Jada Martinez Reese, James Symth, Jayla Flowers, Jimmy Nealis, Jordan Guzman, Kendall Fauntleroy, Kimberly Ramirez, Lakely Nealis, Logan Berger, Marcus Halm, Raymond Berrellez, Shalom Mejia, Sol Fernandez, Sophia Navarro, Stephana Powell, Tamryn Betts, Victor Goli, Zion Chavez on March 3, 2019 by Jim Riggio. 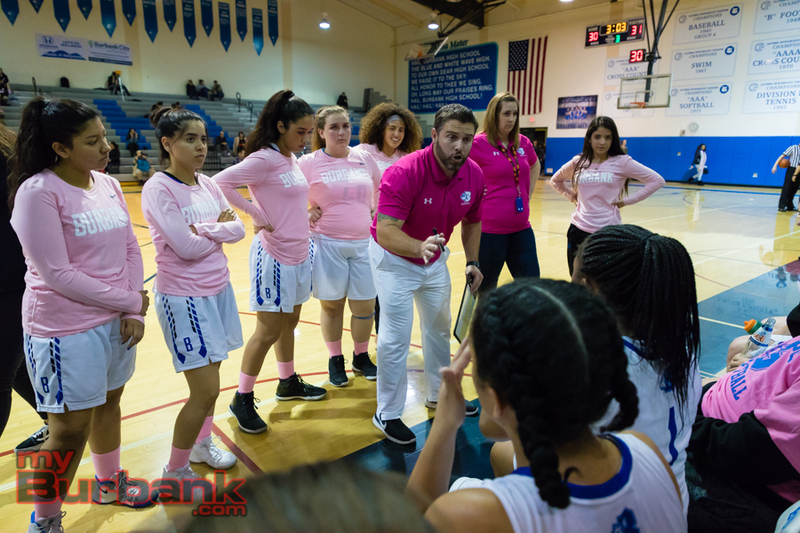 From the outset, it seemed that everything was going wrong for the Burbank High girls’ basketball team. 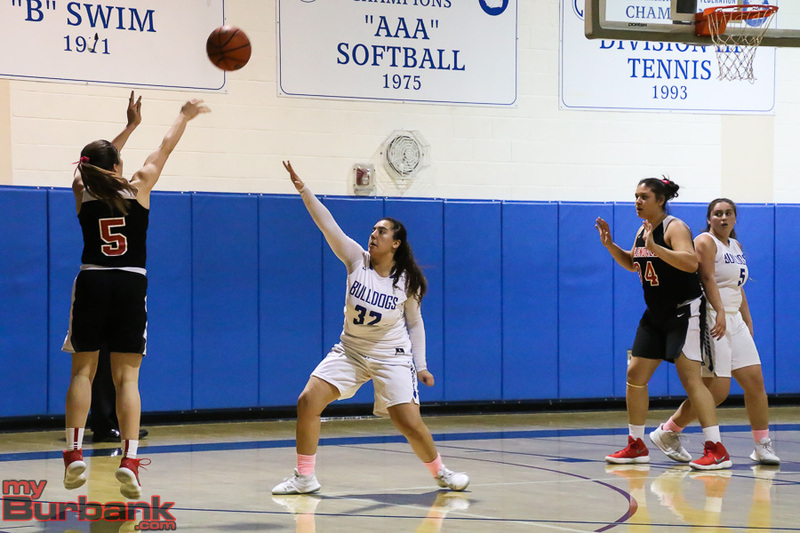 The Bulldogs trailed by six points heading into the second period, were down by 16 at the half and 14 points through three frames and eventually lost 53-43 to host Crescenta Valley on Friday evening in a Pacific League matchup. 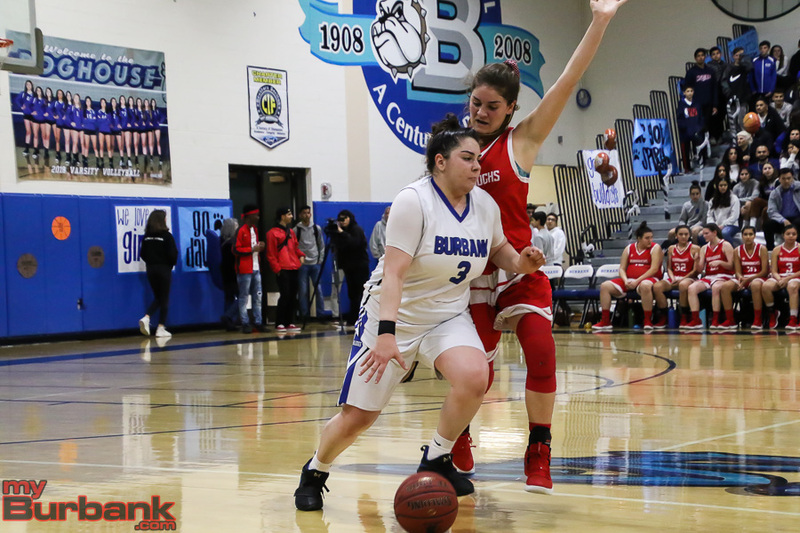 Senior small forward Osanna Tirityan and sophomore guard Erika Montoya each scored 12 points for the Bulldogs, who trailed 13-7 after one quarter and 30-14 at the intermission. 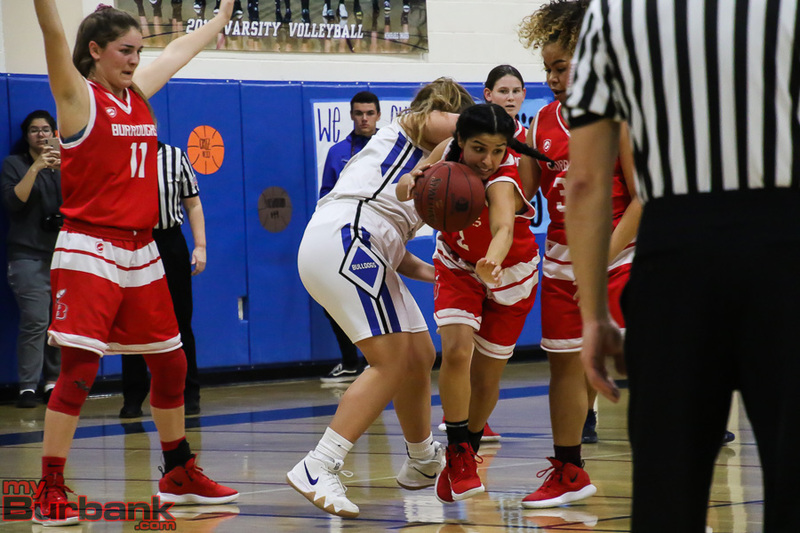 Burbank made four of 18 shots (22.2 percent) from the field at the break and 12 of 40 (30 percent) during the game, while Crescenta Valley drilled 15 of 59 (25.4 percent) from the floor. 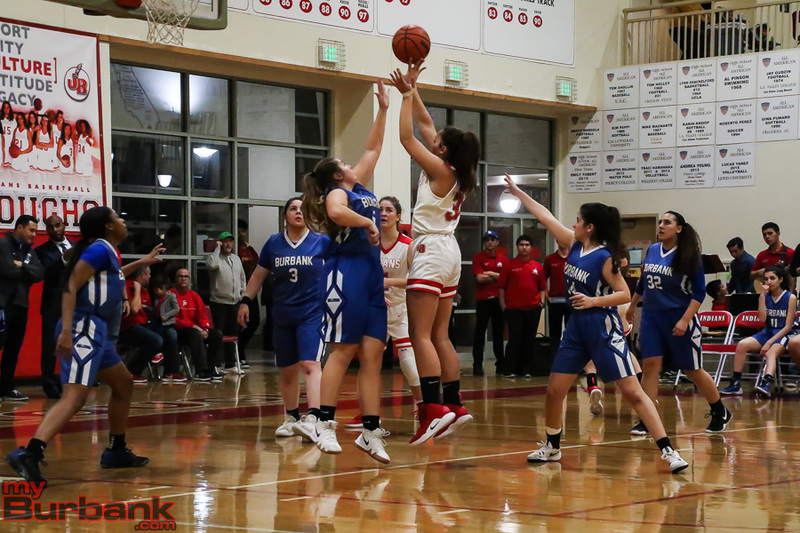 The Bulldogs (8-5 and 2-2 in league) outscored the Falcons 12-10 in the third quarter and tallied 17 points to 13 points for the Falcons (7-5 and 3-1 in league) in the fourth frame. 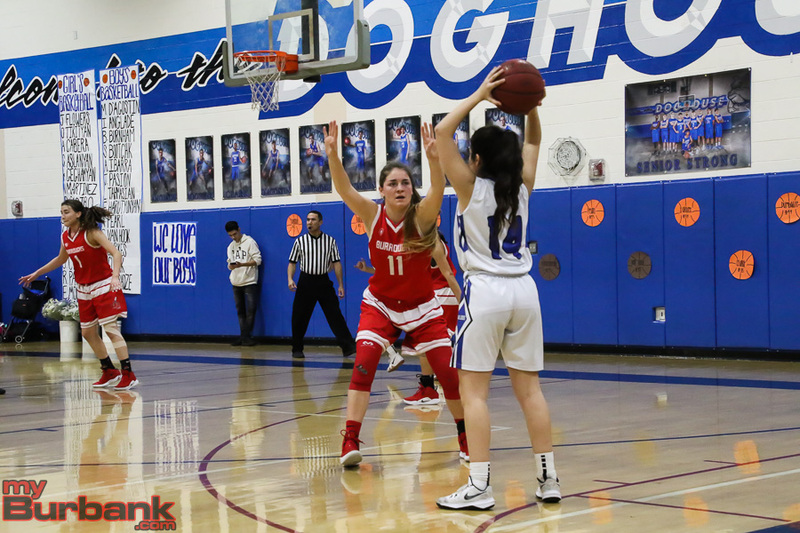 Montoya’s three-pointer with 5:43 left in the game sliced Crescenta Valley’s advantage to 42-31. 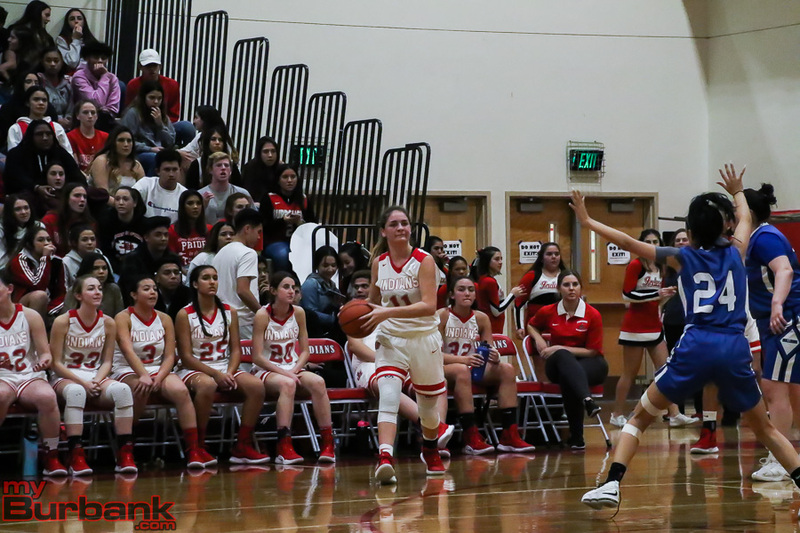 When junior guard Brianna Castro (six points) knocked down a trey with 3:29 showing it trimmed the Falcons’ lead to 46-38. 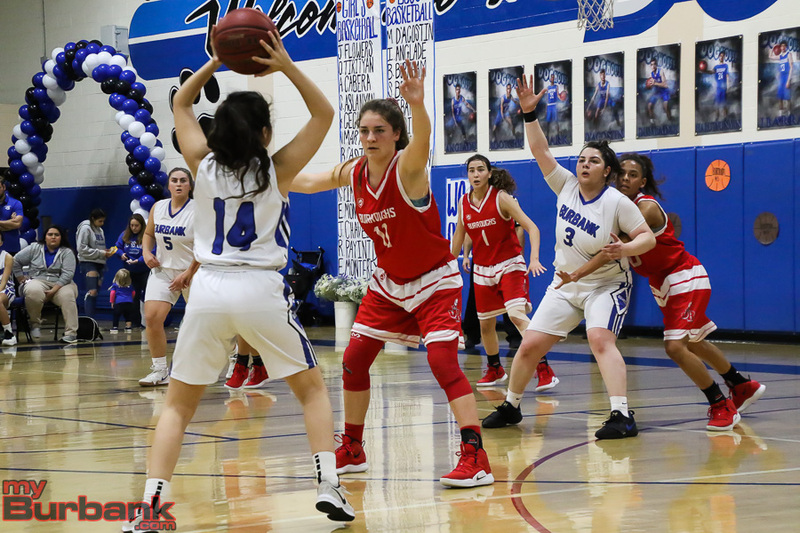 Senior guard Georgina Kregorian scored 11 of her 16 points. 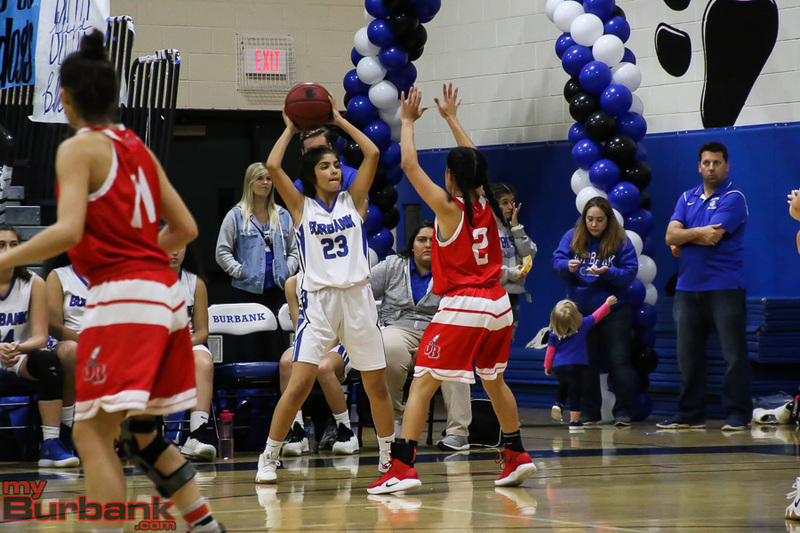 Kregorian nailed three of her four three-pointers in the opening period. 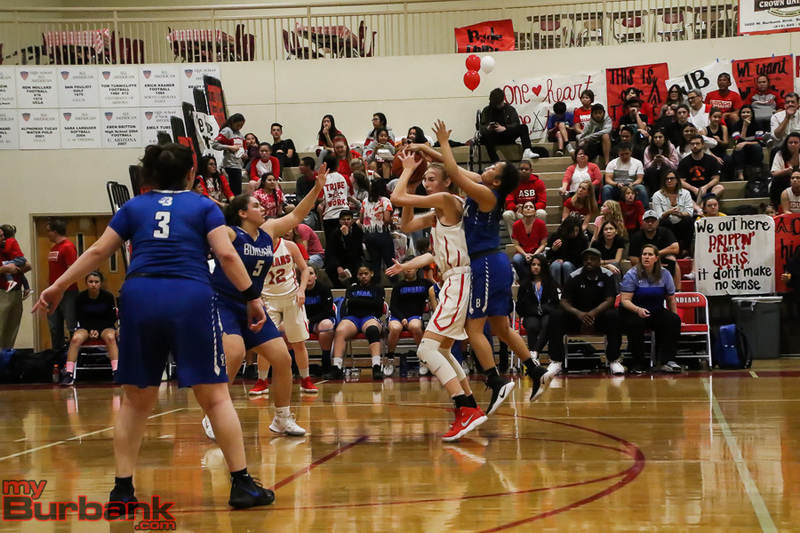 The Falcons made three of 12 (25 percent) from the floor and four of six from the free-throw line in the initial period. The Falcons hit six of 18 (33.3 percent) from the floor in the second quarter with Kregorian scoring five points. 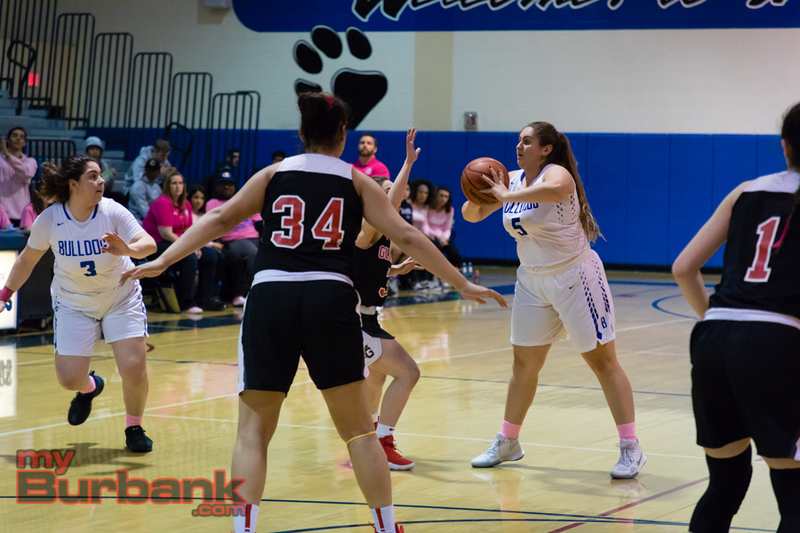 The Bulldogs hammered three of 10 (30 percent) from the field in the initial frame and one of eight (12.5 percent) in the second period, but made five of eight (62.5 percent) of their free throws. 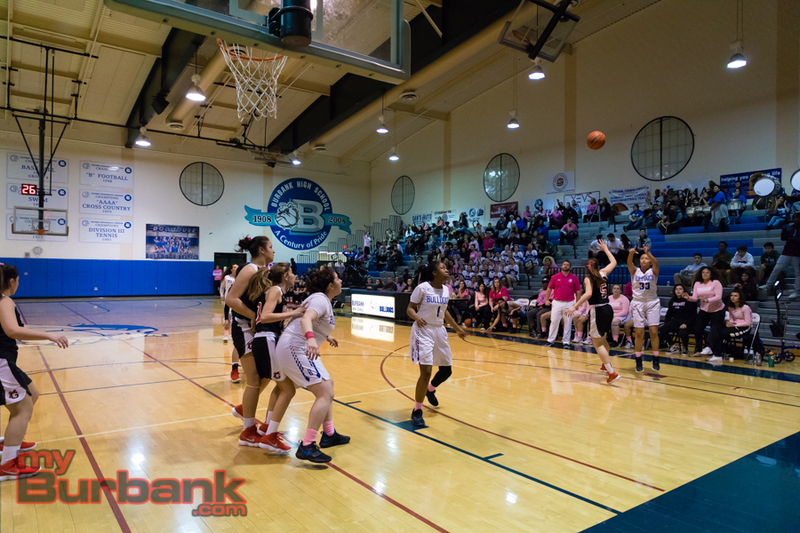 Burbank was successful on six from three-point range and Crescenta Valley dropped in five treys. 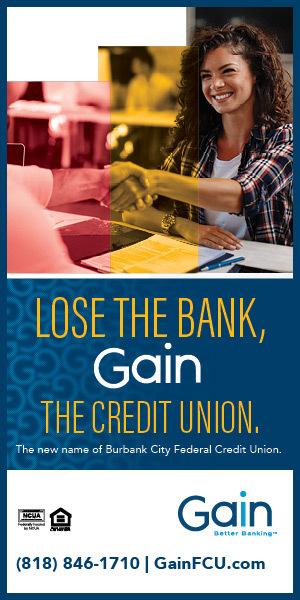 On the night, Burbank converted 13 of 20 (65 percent) of its charity tosses, while Crescenta Valley hit 18 of 26 (69.2 percent). Sophomore small forward Jayla Flowers (12 points) scored two points in the opening frame. 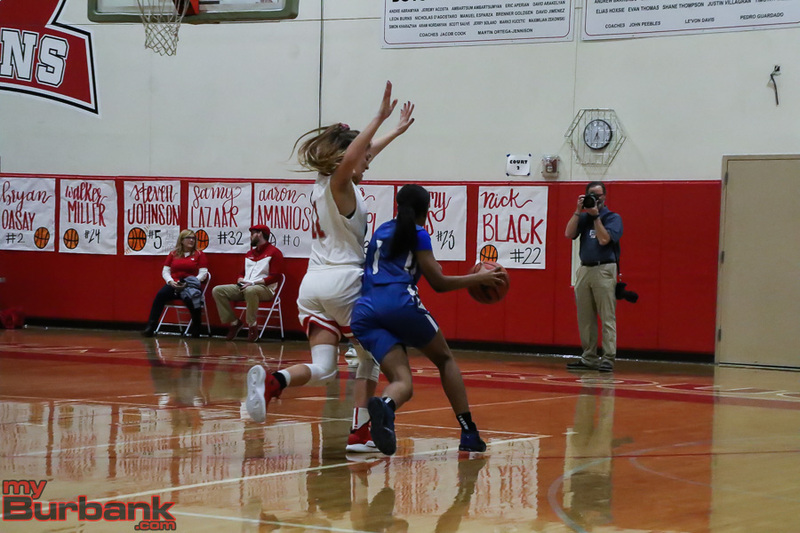 Flowers then added five points in the second quarter and after not scoring in the third period, made five free throws in the fourth quarter. 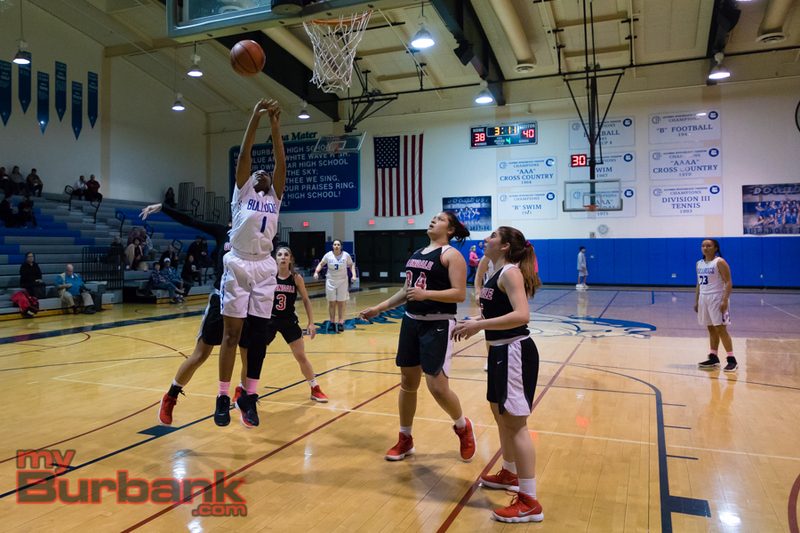 Tirityan scored only two baskets, but was on the money from the free-throw line, making eight of 10. 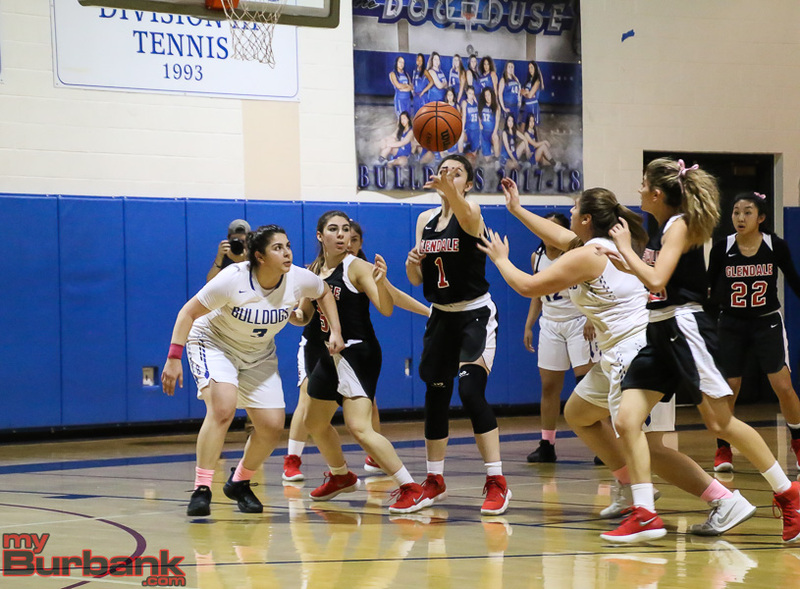 Junior power forward Adrianna Cabrera had two points for the Bulldogs and senior point guard Emily Monterrey tossed in one point. 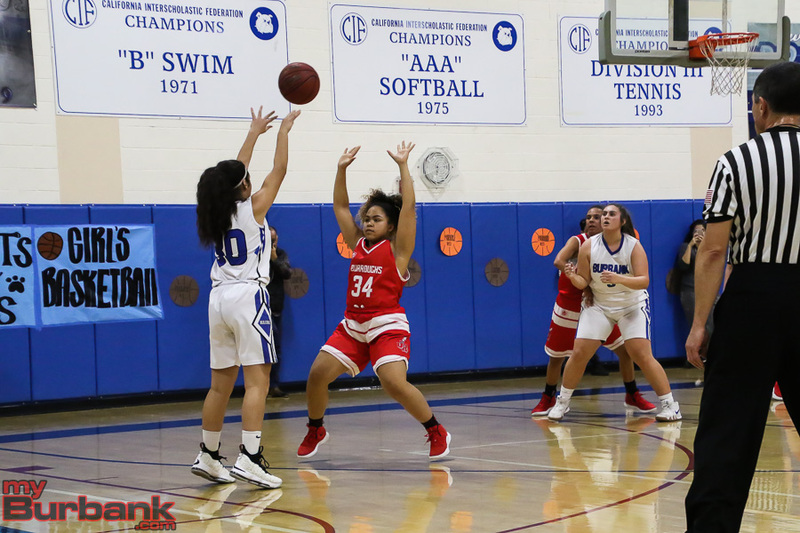 Crescenta Valley senior shooting guard Caity Bouchard tallied 12 of her 16 points in the second half and junior point guard Denise Dayag collected nine points. 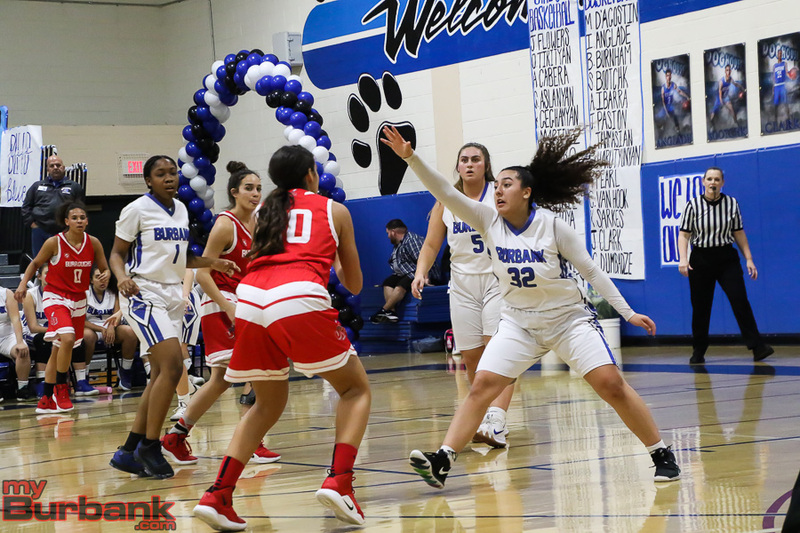 This entry was posted in Girls Basketball, Sports and tagged Adrianna Cabrera, Brianna Castro, Burbank High, Emily Monterrey, Erika Montoya, girls basketball, Jayla Flowers, Osanna Tirityan, Pacific League on December 15, 2018 by Rick Assad. 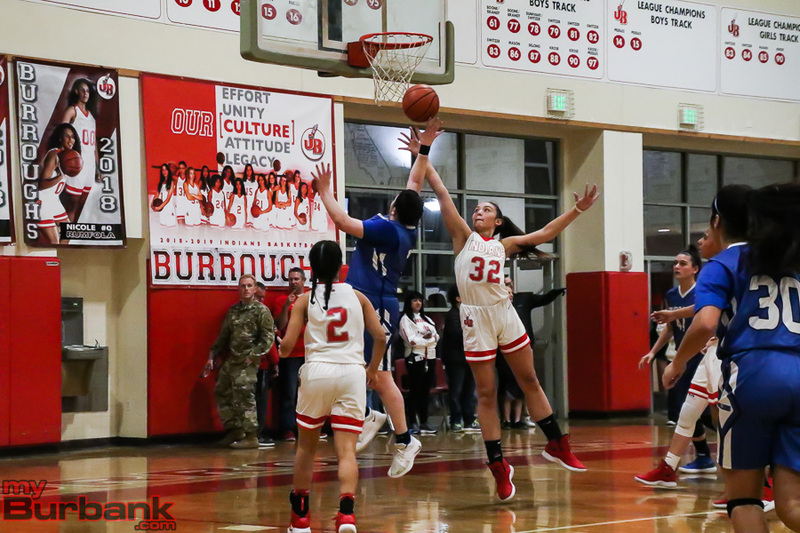 When it comes to girls’ basketball, Burroughs High and Burbank both have quality programs and strong coaching leadership. 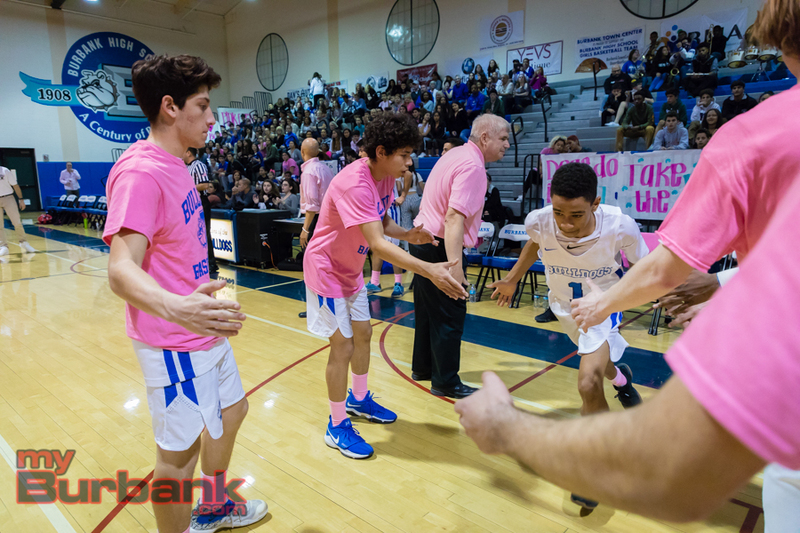 The Indians are coming off a season in which they went 23-8 overall and 11-3 in the Pacific League while reaching the CIF Southern Section playoffs. 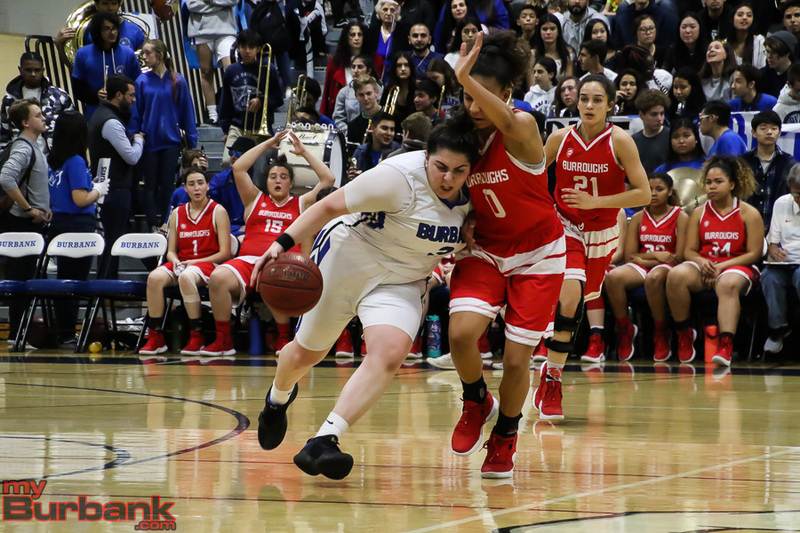 Burroughs lost a key player to graduation in Marin Grote, a 6-4 center, who averaged a double-double in points and rebounds and also played volleyball where she was a standout. Currently Grote is at the University of Washington where she is on the women’s volleyball team. It’s always exciting when the two city rivals meet. 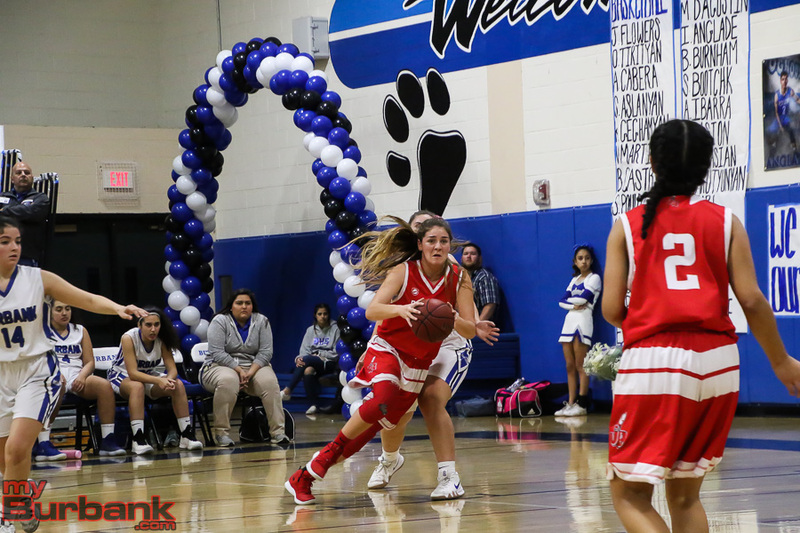 Burroughs will host Burbank on Jan. 11 and the Bulldogs will host the Indians on Jan. 31. 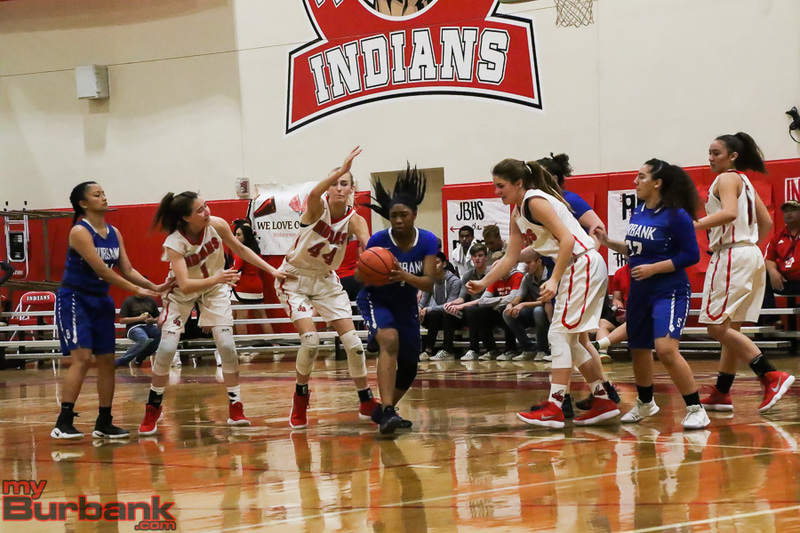 The Indians, who are undefeated this season at 6-0, will very likely lean heavily on Faith Boulanger, a highly-skilled 5-11 sophomore center/power forward, who averaged 12.7 points with 7.3 rebounds and was selected all-league, first-team. 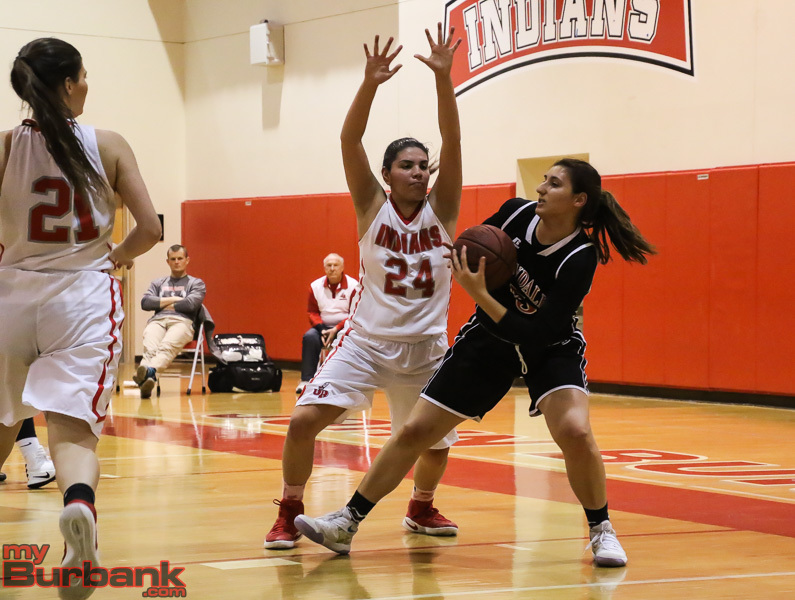 Despite being a freshman, Boulanger proved her worth early and was a major force on offensive and defensive. 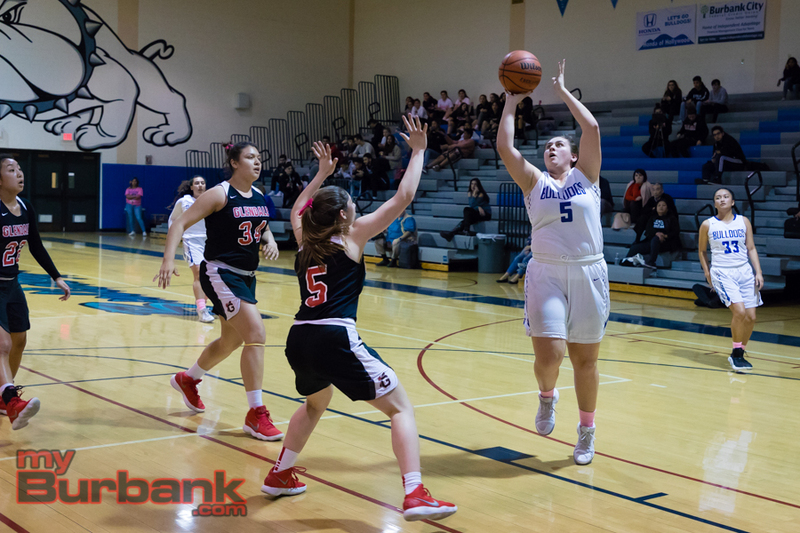 Kayla Wrobel, a 5-10 sophomore power forward was a second-team, all-league pick after tossing in 5.4 points and 5.2 boards per game. 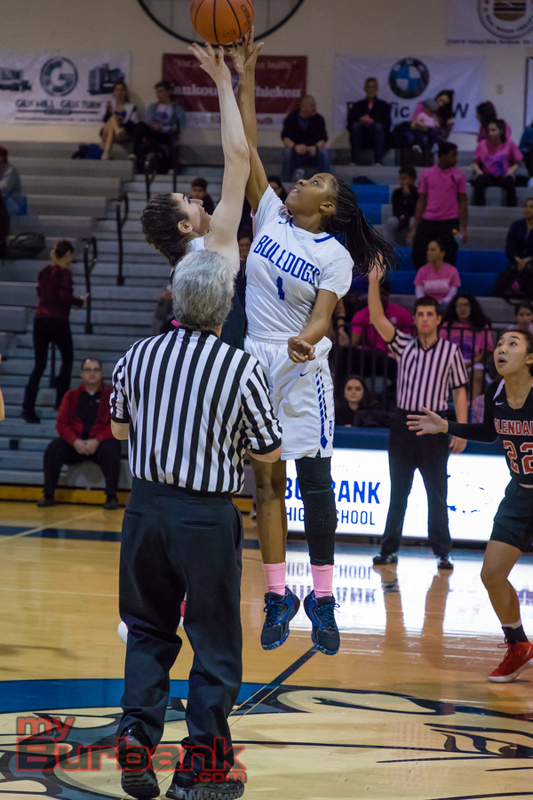 Dyani Del Castillo, a 5-8 sophomore shooting guard averaged 5.6 points and 4.4 caroms which translated into being tabbed honorable mention. 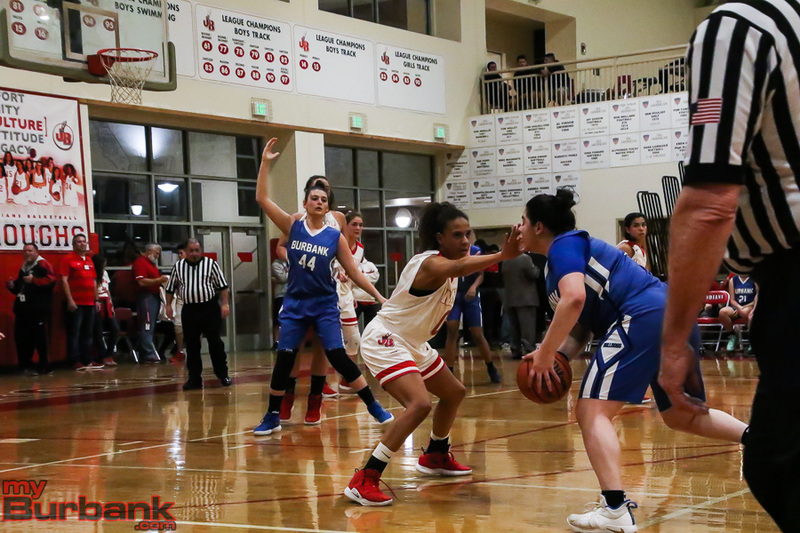 Ariana Farias is a 5-3 senior point guard and will lead the offense for Oganyan. 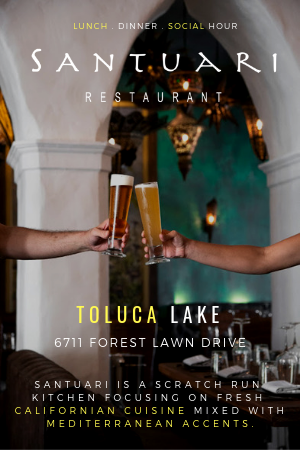 This job is critical because Farias sets the tone. 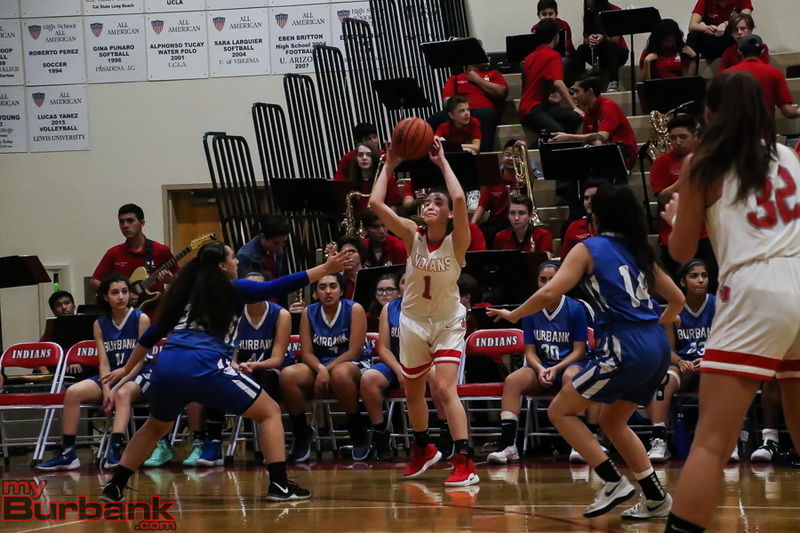 There are six returners from last year’s team and they include seniors Nicole Rumfola, a 5-9 small forward, Camryn Lotka, a 5-7 shooting guard, Emily Gutierrez, a 5-4 point guard and Jillian Kukawski, a 5-7 shooting guard. 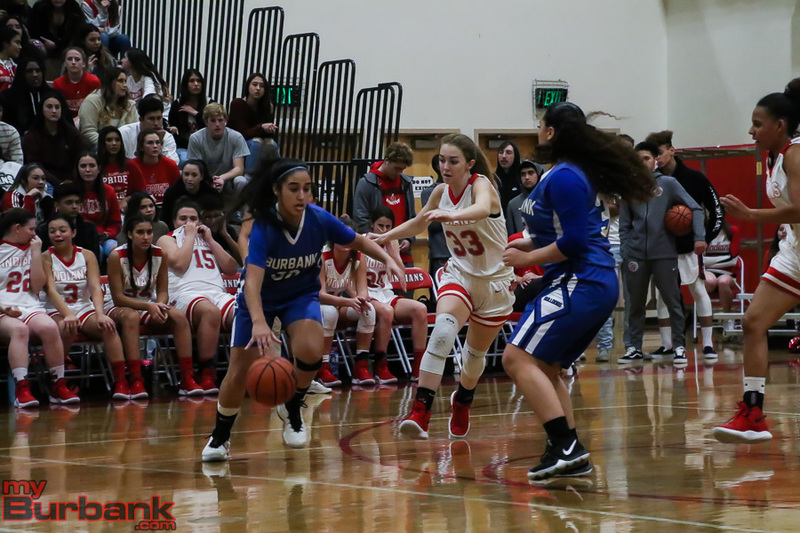 There are two juniors on the squad and they are Sophie Hawkins, a 5-7 shooting guard and A’sia Morales, a 5-7 shooting guard. The rest of the team will consist of seniors Jhazmin Pitts and Jordyn Jackson and freshman Noor Fahs. 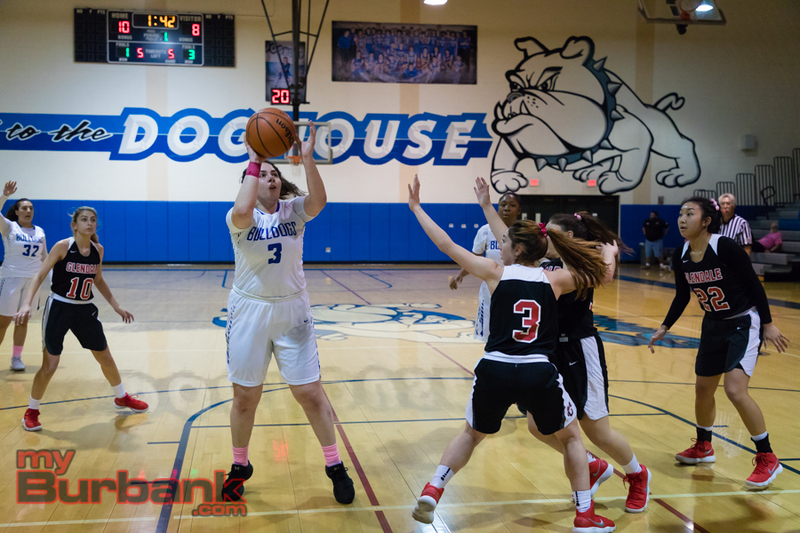 It’s a certainty that the best player on the floor for the Bulldogs, who went 10-18 and 5-9 in league and are 5-2 this season, will be Osanna Tirityan, a 5-9 senior small forward. 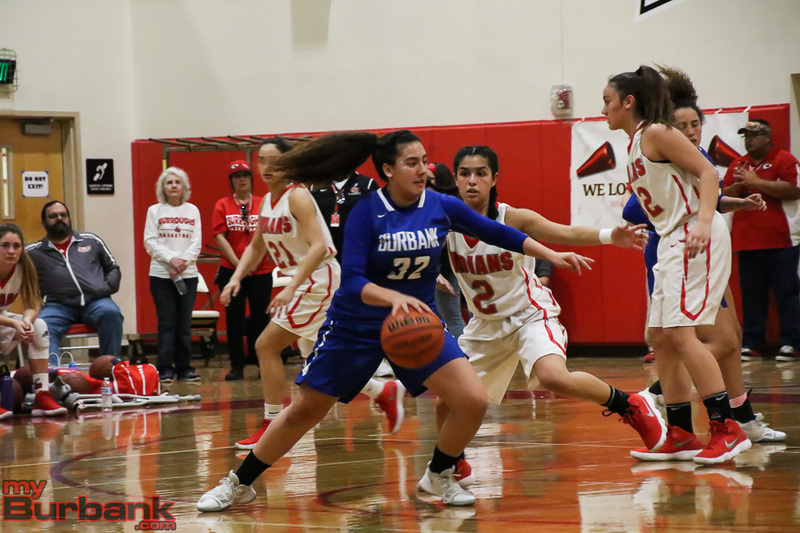 “She does everything for us,” Burbank interim coach Bruce Breeden said of Tirityan, who averaged 14 points and 11 rebounds and was named all-league, first-team three consecutive years. 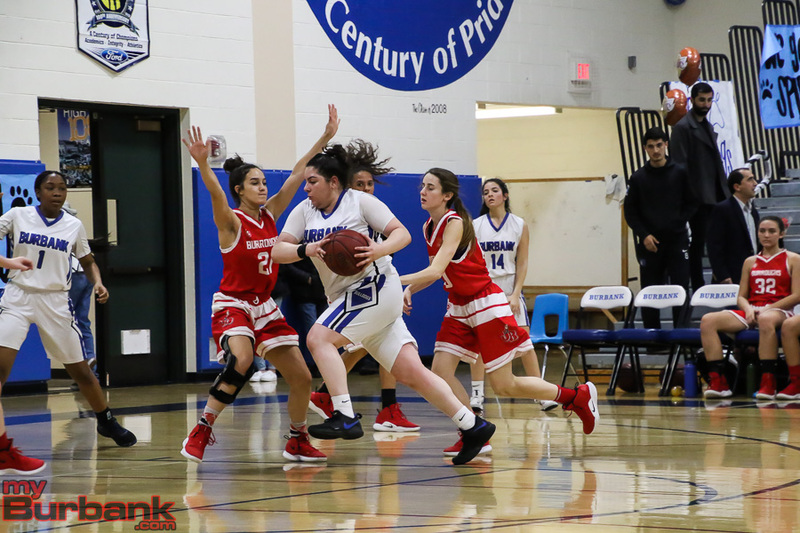 Sofia Aslanian, a 5-10 senior power forward, is likewise a three-year starter. 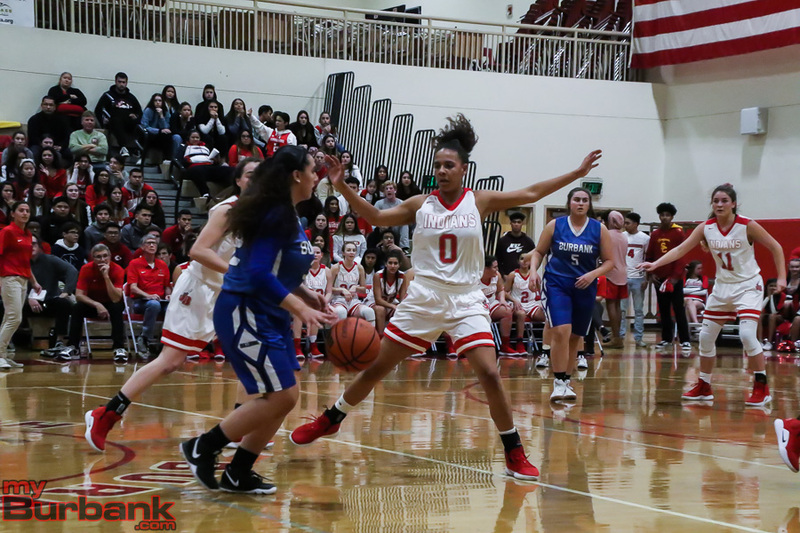 “Sofia controls the boards and gives us leadership,” Breeden said. 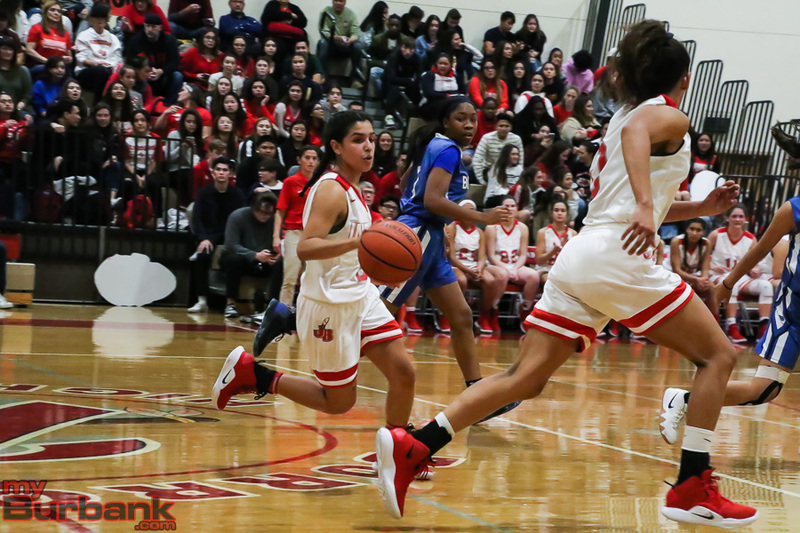 Jayla Flowers is a 5-7 sophomore shooting guard and junior Brianna Castro is a 5-5 shooting guard. 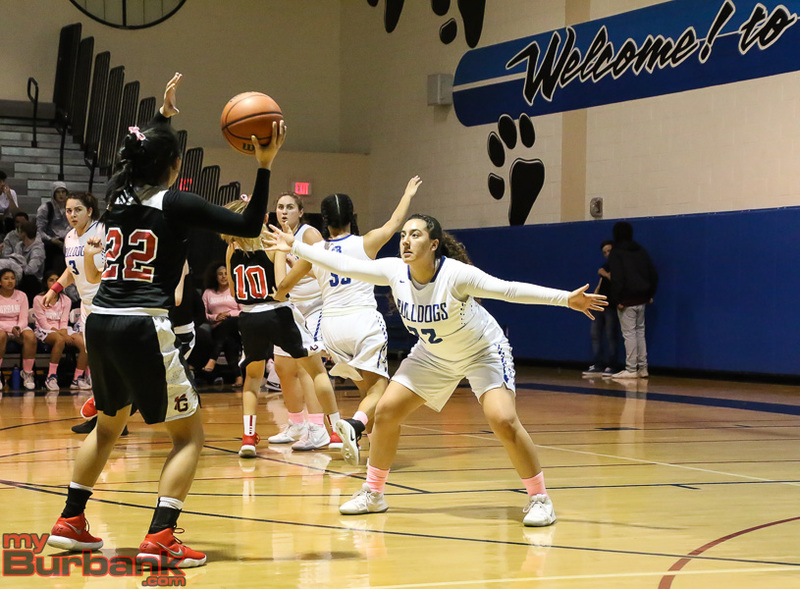 Also on the team will be Emily Monterrey, a 5-5 senior point guard, Jasmine Chavez, a 5-3 senior point guard and Roxy Payinid, a 5-6 sophomore point guard. 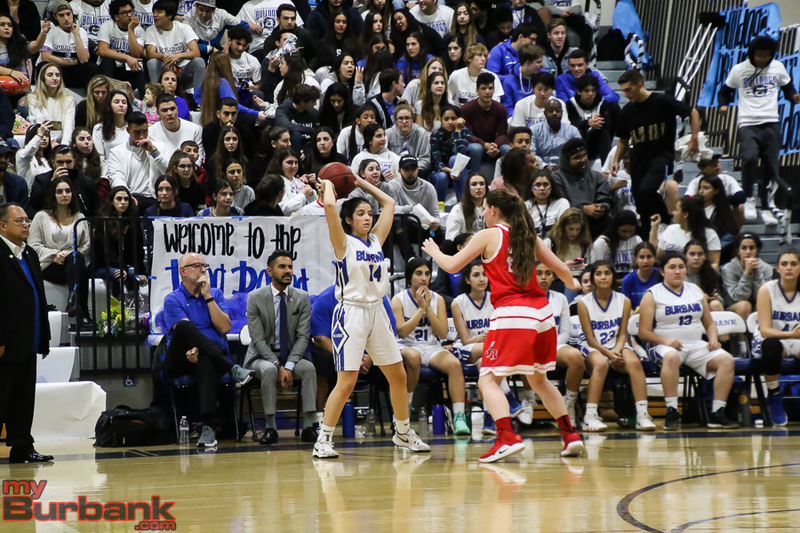 Rounding out the squad are Dakota Cortez, a 5-6 senior small forward, Adel Bandarian, a 5-9 junior power forward, Adrianna Cabrera, a 5-8 junior small forward and Kim Pimentel, a 5-4 sophomore point guard. 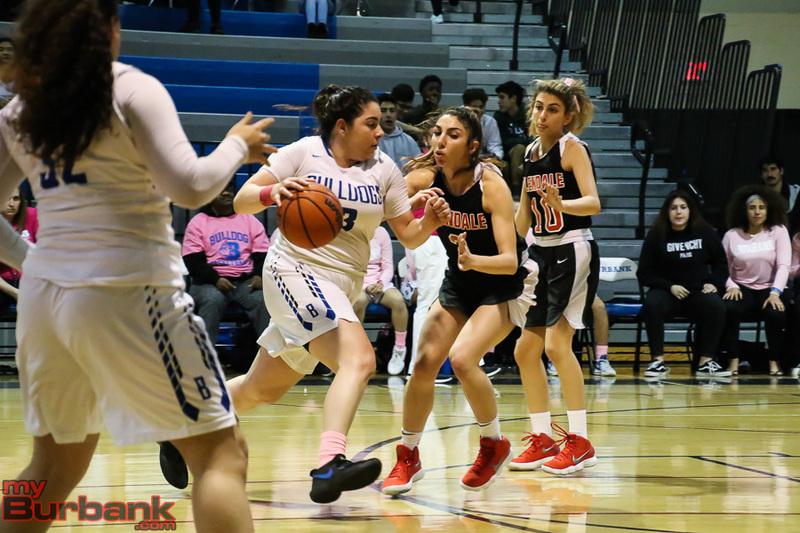 Rounding out the squad will be senior small forward Serlie Pouladian, senior small forward Knar Geghamya, junior small forward Val Martinez and sophomore guard Erika Montoya. 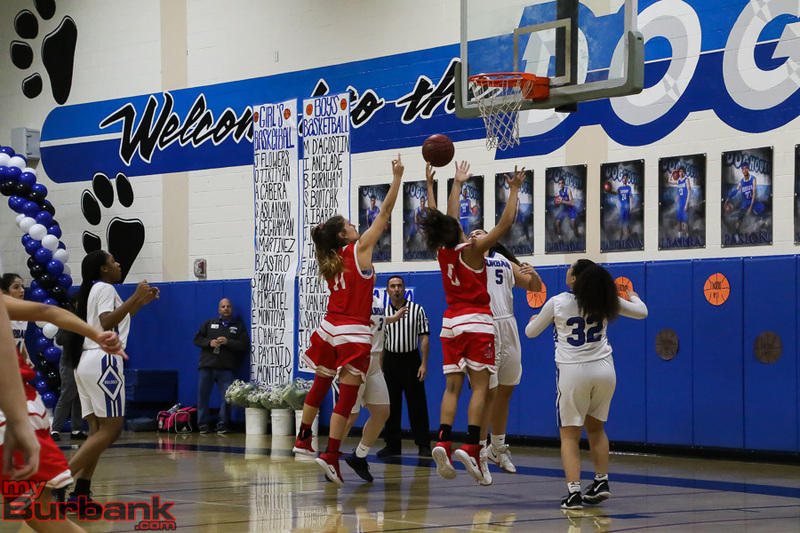 This entry was posted in Girls Basketball, Sports and tagged A'sia Morales, Adel Bandarian, Adrianna Cabrera, Ariana Farias, Brianna Castro, Burbank High, Burroughs High, Camryn Lotka, Dakota Cortez, Dyani Del Castillo, Emily Gutierrez, Erika Montoya, Faith Boulanger, girls basketball, Jasmine Chavez, Jayla Flowers, Jhazmin Pitts, Jillian Kukawski, Jordyn Jackson, Kayla Wrobel, Kim Pimentel, Knar Geghamyan, Nicole Rumfola, Noor Fahs, Osanna Tirityan, Roxy Payinid, Serlie Pouladian, Sofia Aslanian, Sophie Hawkins, Valerie Martinez on November 30, 2018 by Rick Assad. 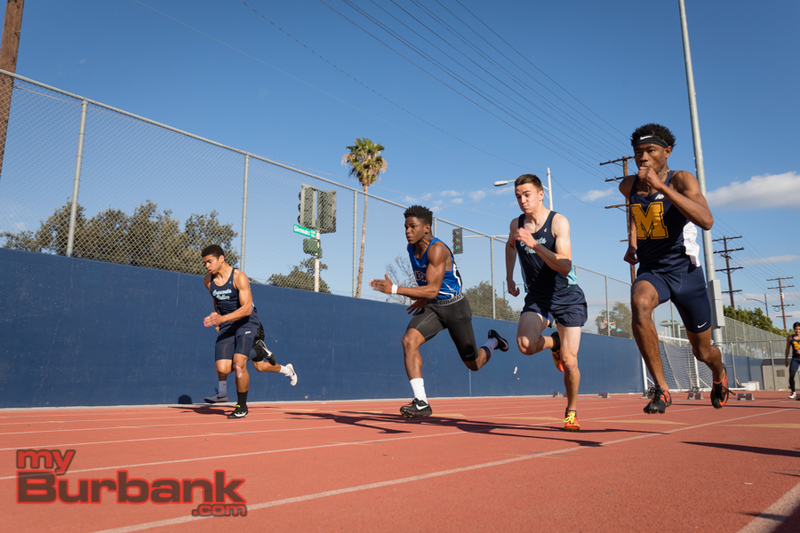 The road to a Pacific League title in boys’ track and field got a lot better Thursday afternoon when Burbank High hosted Crescenta Valley and Muir highs. The Bulldogs defeated both, topping the Falcons 86-50 and the Mustangs 101-30. This comes a week after defeating Arcadia. Hospidales, who is a junior, won the 100 and 200. He won the 100 in 10.9 seconds and the 200 in 22.8. “It was hand-timed though,” Hospidales said about breaking 11 seconds in the 100. He ran 23.18 against Arcadia the previous week in the 200. 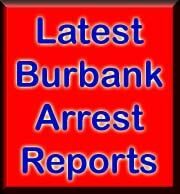 Burbank also got a big day from Sergio Aguilar. 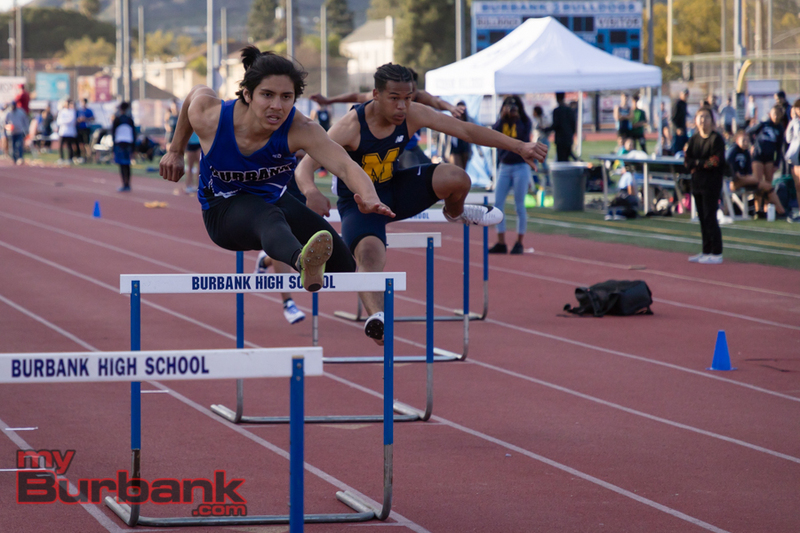 The defending league champion in the 110 high hurdles, Aguilar actually was beaten in the event by Muir’s Reggie Myles, who finished in 15.5 seconds. Aguilar was second in 16.0. 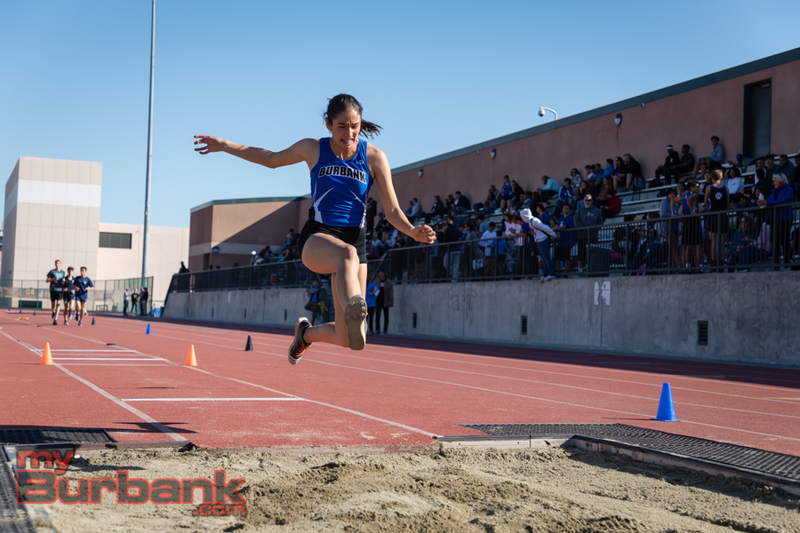 However, Aguilar took the 300 intermediate hurdles (41.3) and won the high jump at 5 feet, 10 inches. He was second in the long jump (19-7). Junior Bryan David won the 400 (51.6). Junior Erik Harutyunyan won the triple jump (40-2) and senior Chris Aslo took the discus (117-9). Sophomore Victor Goli was second in the 1,600 (4:28.5). Junior Jahir Olvera was second in the 800 (2:01.2). Junior Chris Stanis was second in the 400 (54.5) and the 300 hurdles (41.9). 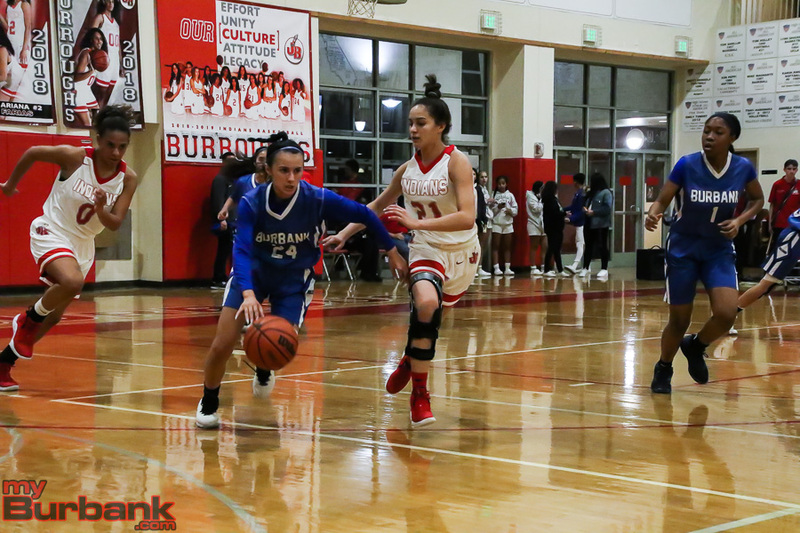 The Burbank girls’ team fell 84-51 to Crescenta Valley but defeated Muir 102-29. Freshman Jayla Flowers won the 100 (12.6), the long jump (17-1 ½) and the triple jump (34-8). Fellow freshman Tamryn Betts won the high jump (4-10). Junior Alissa Petrosyan won the pole vault (8-0). Sophomore Tiffany Safar won the shot put (28-8). Junior Paula Jaramillo was second in the 100 (13.1) and the 200 (27.1). Sophomore Sol Fernandez was second in the 3,200 (11:48.3) and third in the 1,600 (5:26.8). 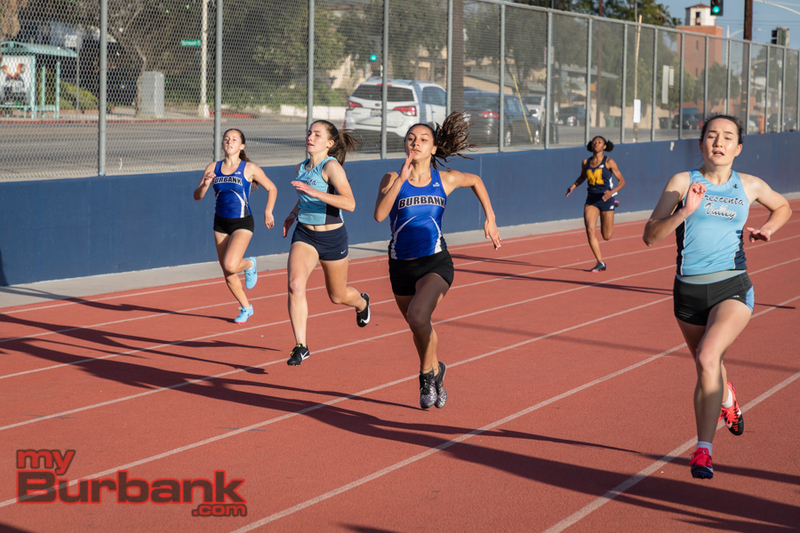 This entry was posted in Sports, Track and tagged Alissa Petrosyan, Bryan David, Burbank track and field, Chris Aslo, Chris Stanis, Erik Harutyunyan, Jahir Olvera, Jayla Flowers, Oladele Hospidales, Paula Jaramillo, Sergio Aguilar, Sol Fernandez, Tamryn Betts, Tiffany Safar, Victor Goli on March 16, 2018 by Jim Riggio. 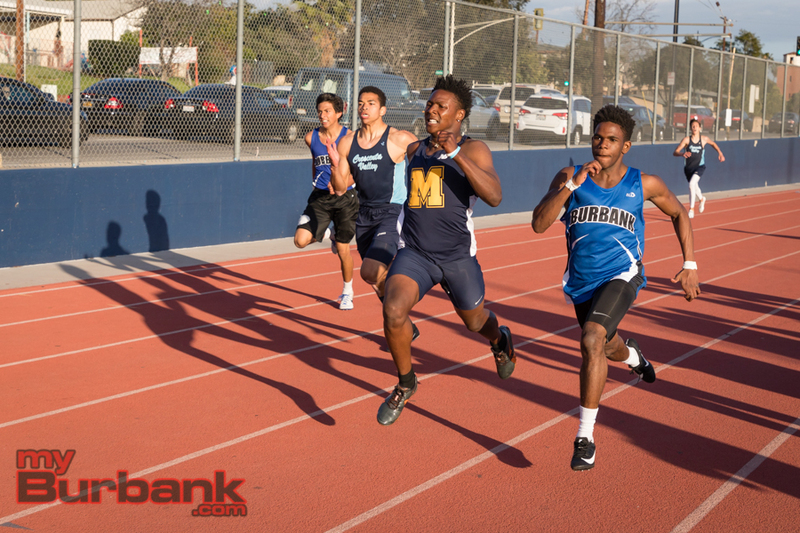 The local track and field scene should be quite interesting this year as Burroughs High returns a number of veterans with vast experience whereas Burbank High has a group of young athletes who appear to be extremely talented. 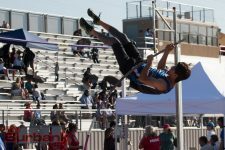 The Indians have lost their top returner in Master’s Meet pole vault qualifier Christian Valles, who transferred to Canyon High in Santa Clarita. But the Indians have a pair of seniors with the ability to make long postseason runs in senior distance runners Jagdeep Chahal and Alexander Hirsch. Seniors David Lennstrom and Aashwin Roy are the top returning sprinters. Sophomore Caleb Black is a threat to be a new top talent in the 400. Sophomore Ryan Thomas should lead the way in the jumping events. Seniors Grant Housley and Sarkis Tatarian will lead the way in the throwing events. 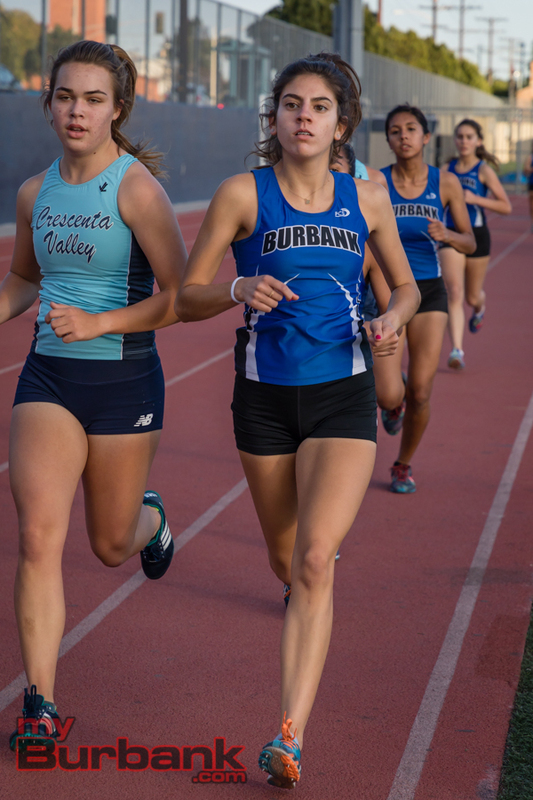 For the girls’ side, senior distance runner Emily Virtue returns and should challenge to be one of the top runners in the CIF. Senior Catrina Villalpando, who came off a fine soccer season, is one to look out for in the 800. Senior pole vaulters Alex Akobian and Elizabeth Switzer have already both cleared 10 feet, 10 inches in the early season. Senior Kate Jones as well as juniors Jada Reese and Valerie Reveles should lead the group of sprinters. Junior Priscilla Murillo is the top returning thrower. 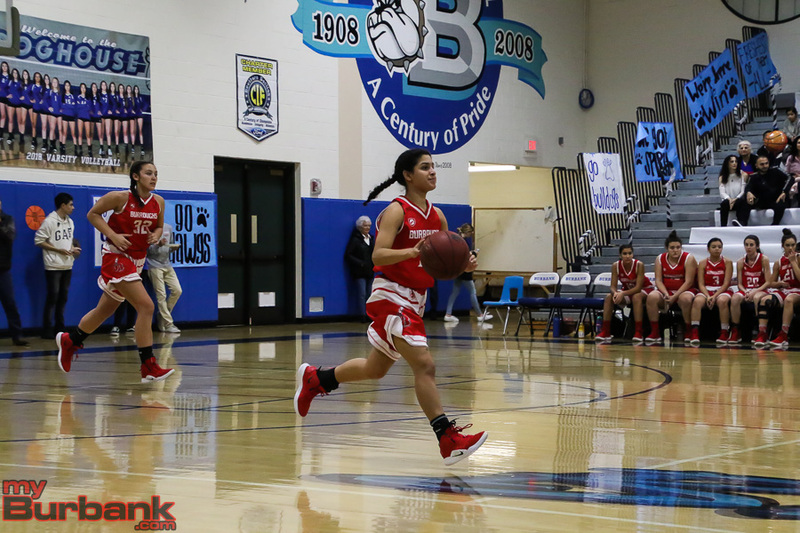 The Bulldogs have been blessed on the girls’ team by the addition of freshman sensation Jayla Flowers, who competed at the Junior Olympics last summer and is nationally ranked in both the long and triple jumps. She will also compete in the sprints and on relays. 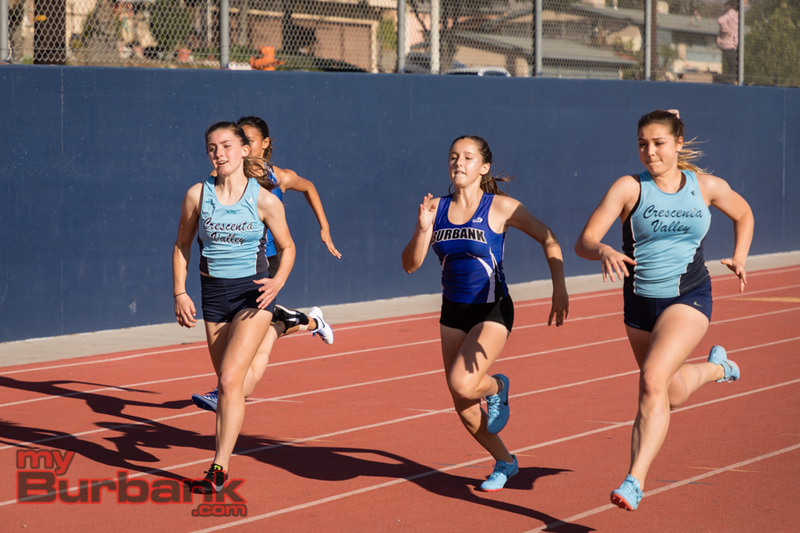 Junior Paula Jaramillo and Isabel Partida should lead the group of sprinters. Junior Alissa Petrosyan and sophomore Amira Ottoson give the Bulldogs some talented in the hurdle events. Freshman Tamryn Betts is a multi-talented athlete who can run the sprints and hurdle events, as well as relays and field events. The distance running group is led by sophomore Sol Fernandez, junior Jamie Levin and senior Noemi Apreza. 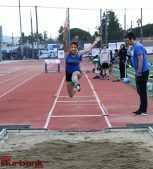 In the jumping events, the Bulldogs will rely on junior Andrea Castresana. Sophomores Kim Ramirez and Bella Lamanna Stevens will lead the way in the throwing events. 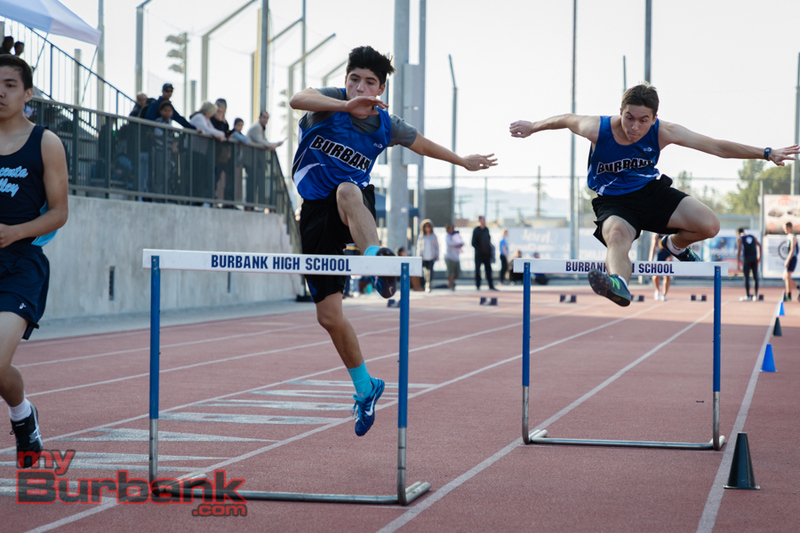 For the Burbank boys’ team, senior Sergio Aguilar leads the way as the defending league champion in the 110 hurdles. Senior Nathanael Ehmann and junior Chris Stanis should provide support in the hurdle events. Junior Oladele Hospidales and sophomores Cole Le’au and Bryan David should lead the way in the sprint events. The boys’ distance runners are young and talented, led by junior Jahir Olvera and sophomores Victor Goli and Dayne Ellis. 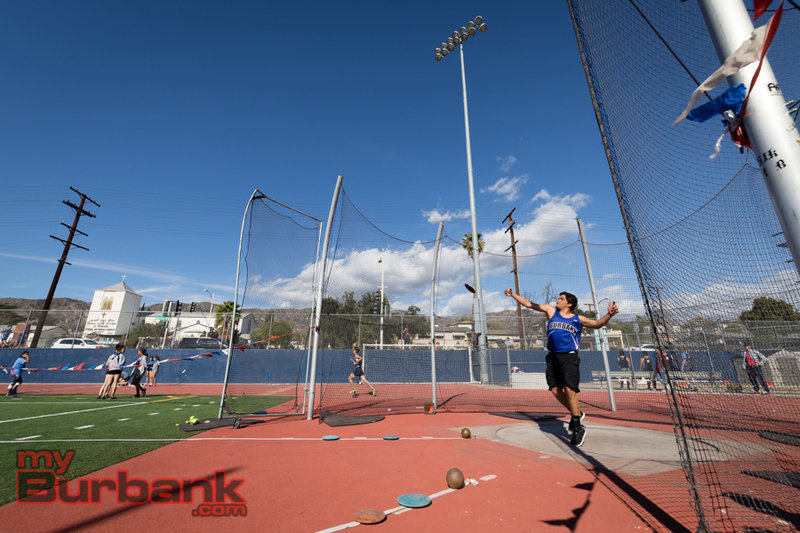 In the field events, Burbank will rely on the help of juniors Zion Chavez, Erik Harutyunyan, and Sam Vaseghyzand in the jumping events. Senior Chris Aslo and sophomore James Smyth are expected to lead the group of throwers. 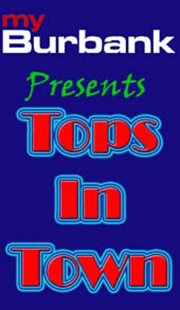 This entry was posted in Sports, Track and tagged Aashwin Roy, Alex Akobian, Alexander Hirsch, Alissa Petrosyan, Amira Ottoson, Andrea Castresana, Bella Lamanna Stevens, Bryan David, Caleb Black, Catrina Villalpando, Chris Aslo, Chris Stanis, Cole Le’au, David Lennstrom, Dayne Ellis, Elizabeth Switzer, Emily Virtue, Erik Harutyunyan, Grant Housley, Isabel Partida, Jada Reese, Jagdeep Chahal, Jahir Olvera, James Smyth, Jamie Levin, Jayla Flowers, Kate Jones, Kim Ramirez, Nathanael Ehmann, Noemi Apreza, Oladele Hospidales, Paula Jaramillo, Priscilla Murillo, Ryan Thomas, Sam Vaseghyzand, Sarkis Tatarian, Sergio Aguilar, Sol Fernandez, Tamryn Betts, Valerie Reveles, Victor Goli, Zion Chavez on February 25, 2018 by Jim Riggio.